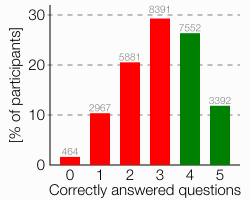 In 2011, I launched the “The 3-Minute Test: What do you know about SQL performance.” It consists of five questions that follow a simple pattern: each question shows a query/index pair and asks if it demonstrates proper indexing or not. Till today, this test has become one of the most popular features on Use The Index, Luke and has been completed more than 28,000 times. Although the quiz was created for educational purposes, I was wondering if I could get some interesting figures out of these 28,000 results. And I think I could. However, there are several things to keep in mind when looking at these figures. First, the quiz uses the surprise factor to catch attention. That means, three questions show cases that look fine, but aren’t. One question does it the other way around and shows an example that might look dangerous, but isn’t. There is only one question where the correct answer is in line with the first impression. Another effect that might affect the significance of the results is that there was no representative selection of participants. Everybody can take the quiz. You can even do it multiple times and will probably get a better result the second time. Just keep in mind that the quiz was never intended to be used for scientific research upon the indexing knowledge in the field. Nevertheless, I think that the size of the dataset is still good enough to get an impression. Below I’ll show two different statistics for each question. First, the average rate at which this question was correctly answered. 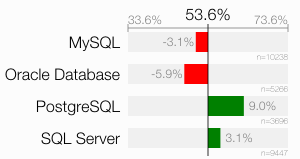 Second, how this figure varies for users of MySQL, Oracle, PostgreSQL and SQL Server databases. In other word, it says if e.g. 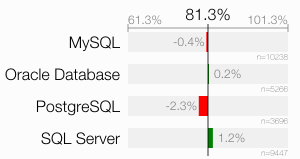 MySQL users are more knowledgeable about indexing as PostgreSQL users. Spoiler: It’s the other way around. The only reason I’m in the lucky position to have this data is that the test sometimes uses vendor specific syntax. 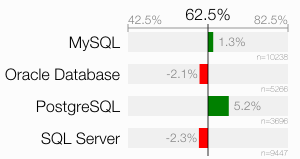 For example, what is LIMIT in MySQL and PostgreSQL is TOP in SQL Server. Therefore, the participants have to select a database at the beginning so that the questions are shown in the native syntax of that product. The correct answer is “bad practice” because the index on date_column cannot be used when searching on something derived from date_column. If you don’t believe that, please have a look at the proof scripts or the explanations shown at the end of the test. They also contain links to the Use The Index, Luke pages explaining it in more detail. However, if you didn’t know how functions effectively “disable” indexes, you are not alone. Only about two-thirds gave the correct answer. And as for every multiple choice test, there is a certain probably to pick the correct answer by chance. In this cases it’s a 50/50 chance — by no means negligible. I’ve marked this “guessing score” in the figure to emphasize that. Although this result is quite disappointing — I mean it’s just 17% better than guessing — it is no surprise to me. What is a surprise for me is how the result differs amongst the users of different databases. 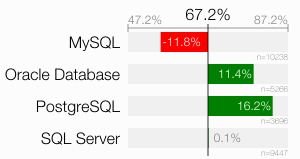 An effect that might explain this result is that MySQL doesn’t support function-based indexes while Oracle and PostgreSQL do. Function-based indexes allow you to index expressions like TO_CHAR(date_column, 'YYYY'). Although it is not the recommended solution for this case, the pure existence of this feature might make users of the Oracle and PostgreSQL database more aware of this problem. SQL Server offers a similar feature: although it cannot index expressions directly, you can create a so-called computed column on expressions, which in turn can be indexed. The index doesn’t need to be changed. This solution is very flexible because it supports queries for different ranges too — e.g. by week or month. This is the recommended solution. As a curious guy, I’d love to know how many of the people who correctly answered this question were thinking of the sub-optimal solution to use a function-based index. I’d rate this solution half-correct at best. This is the question that is supposed to look dangerous, but isn’t. Generally, it seems like people believe order by must always sort the data. This index, however, eliminates the need to sort the data entirely so that the query is basically as fast as a unique index lookup. Please find a detailed explanation of this trick here. This result is particularly sad because I’ve seen people building caching tables, regularly refilled by a cron jobs, to avoid queries like this. Interestingly, the cron job tends to cause performance problems because it is running in rather short intervals to make sure the cache table has fresh data. However, the right index is often the better option in the first place. Another argument I’m getting in response to this question is that including the ID column in the index would allow an index-only scan. Although this is correct, I don’t consider not doing so a “bad practice” because the query touches only one row anyway. An index-only scan could just avoid a single table access. Obviously there are cases were you need that improvement, but in the general case I’d consider it a premature optimization. But that’s just my opinion. However, following this argument might give us an idea why PostgreSQL users got the best score (again): PostgreSQL did not have index-only scans until version 9.2, which was released in September 2012. As a result, PostgreSQL users could not fall into this trap of thinking an index-only scan can bring major improvements in this case. Undoubtedly, the term “major” is troublesome in this context. The answer is “bad practice,” because the second query cannot use the index properly. Changing the index column order to (b, a) would, however, allow both queries to use this index in the most efficient way. You can find a full explanation here. Adding a second index on (b) would be a poor solution due to the overhead it adds for no reason. Unfortunately, I don’t know how many would have done that. This is also a problem I see almost every day. People just don’t understand how multi-column indexes work. All the per-database results are pretty close together. Maybe because there is no syntactic difference or well-known database features that could have a major influence the answer. Less known features like Oracle’s SKIP SCAN could have a minor impact, of course. Generally, the index-only scan could have a influence too, but it pushes the participants to the “right” answer this time. Note the addition to the index (varchar_pattern_ops). In PostgreSQL, this special operator class is required to make the index usable for postfix wild card searches (e.g. 'TERM%'). I added this because I aimed to find out if people know about the problem of leading wild cards in LIKE expressions. Without the operator class, there are two reasons why it doesn’t work: (1) the leading wild card; (2) the missing operator class. I though that would be too obvious. Retrospectivley, I believe some participants interpreted this operator class as “magic that makes it work” and thus took the wrong answer. My intention with this question was to trap people into the “much faster” option because fetching less data should be faster — except when breaking an index-only scan. The only hypothesis I have for this result is that people might have got the idea that the obvious answer isn’t the correct one. That, however, would mean the 39% score doesn’t prove anything about the knowledge of this phenomenon in the field. Wait a moment, that’s below the guessing score! It’s not just people don’t know, they believe the wrong thing. However, I must admit that the term “major” is very problematic again. When I run this example, the speed-up I get is just 70%. Not even twice as fast. Looking at each question individually is interesting, but doesn’t tell us how many participants managed to answer all five questions correctly, for example. The following chart has that information. Finally, I’d like to boil this chart down to a single figure: how many participants “passed” the test? Considering that the test has only five questions, out of which four are 50/50 questions, I think it is fair to say three correct answers isn’t enough to pass the test. Requiring five correct answers would quite obviously be asking for too much. Requiring four correct answers to “pass” the test is therefore the only sensible choice I see. Using this definition, only 38.2% passed the test. The chance to pass the test by guessing is still 12.5%. To verify my analysis and/or draw your own conclusions. Also includes data that I haven’t used. Especially timestamps that might allow to filter for guessing (e.g. question answered in less than X seconds).